For other uses, see Boom. A boom or a chain (also boom defence, harbour chain, river chain, chain boom, boom chain or variants) is an obstacle strung across a navigable stretch of water to control or block navigation. Booms could be military in nature, with the goal of denying access to an enemy's ships; a modern example is the anti-submarine net. 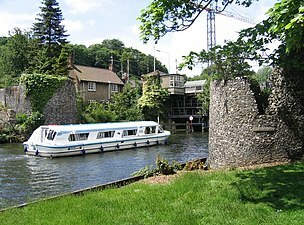 Booms could also be used, especially along rivers, to force passing vessels to pay a toll. A boom generally floats on the surface, while a chain can be on the surface or below the water. 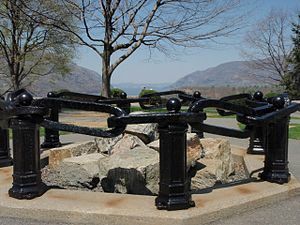 A chain could be made to float with rafts, logs, ships or other wood, making the chain a boom as well. Especially in medieval times, the end of a chain could be attached to a chain tower or boom tower. This allowed safe raising or lowering of the chain, as they were often heavily fortified. By raising or lowering a chain or boom, access could be selectively granted rather than simply rendering the stretch of water completely inaccessible. The raising and lowering could be accomplished by a windlass mechanism or a capstan. Booms or chains could be broken by a sufficiently large or heavy ship, and this occurred on many occasions, including the Siege of Damietta, the Raid on the Medway and the Battle of Vigo Bay.A Frequently, however, attackers instead seized the defences and cut the chain or boom by more conventional methods. The boom at the siege of Londonderry, for example, was cut by sailors in a longboat. As a key portion of defences, booms were usually heavily defended. 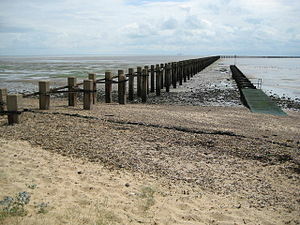 This involved shore-based chain towers, batteries or forts. In the Age of Sail, a boom protecting a harbour could have several ships defending it with their broadsides, discouraging assaults on the boom. On some occasions, multiple booms spanned a single stretch of water. Dutch crusaders break a chain protecting the harbour (at left) in the Siege of Damietta. Wikimedia Commons has media related to Defensive booms. 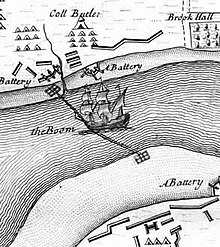 A.^ Some sources have the chain being dismantled instead of broken by a ship in the Siege of Damietta and in the Raid on the Medway. ^ a b c Philip Davis (May 7, 2012). "Site types in the Gatehouse listings — Chain Tower". Gatehouse. Retrieved October 17, 2013. ^ Bob Hind (January 27, 2013). "Filling in the missing links on history of harbour chain". The News. Retrieved October 17, 2013. ^ Gibbon, Edward. The History of the Decline and Fall of the Roman Empire, Volume 6. p. 510. ^ "THE DUTCH IN THE MEDWAY - 1667". M.A. de Ruyter Foundation. Archived from the original on October 21, 2013. Retrieved October 21, 2013. ^ Hervey, Frederic (1779). The Naval History of Great Britain: From the Earliest Times to the Rising of the Parliament in 1779. W Adlard. p. 77. ^ Long, WH (2010). Medals of the British Navy and How They Were Won. Great Britain: Lancer Publishers. p. 24. ISBN 9781935501275. This page was last edited on 12 December 2018, at 22:32 (UTC).